Frederick Courteney Selous was a British explorer, officer, hunter, and conservationist, famous for his exploits in Southeast Africa. His real-life adventures inspired Sir H. Rider Haggard to create the fictional Allan Quatermain character. Selous was also a friend of Theodore Roosevelt, Cecil Rhodes and Frederick Russell Burnham. He was pre-eminent within a select group of big game hunters that included Abel Chapman and Arthur Henry Neumann. He was the older brother of ornithologist and writer Edmund Selous. Frederick Courteney Selous was born on 31 December 1851 at Regent’s Park, London, as one of the five children of an aristocratic family, third generation of part French-Huguenot heritage. His father, Frederick Lokes Slous (original spelling) (1802–1892), was notably Chairman of the London Stock Exchange and his mother, Ann Holgate Sherborn (1827–1913), was a published poet. One of his uncles was the painter Henry Courtney Selous. Frederick had three sisters, Florence (born 1850), Annie Berryman (born 1853), and Sybil Jane (born 1862), and one brother, Edmund Selous (1857–1934), who became a famous ornithologist. Frederick’s love for the outdoors and wildlife was shared only by his brother; however, all of the family members were artistically inclined, besides being successful in business. At 42, Selous settled in Worplesdon, England and married 20-year-old Marie Catherine Gladys Maddy (born 1874), daughter of a clergyman Canon Henry William Maddy, and had three sons, Frederick Hatherley Bruce Selous (1898–1918), Harold Sherborn Selous (1899-1954) and Bertrand Selous who was born prematurely on 6 July 1915 and died 5 days later. He also had three children with various African wives. On 15 January 1867, Selous, at 17, was one of the survivors of the Regent’s Park tragedy, well documented in The Times, when the ice covering the local lake broke with around 200 skaters on it, leaving 40 dead by drowning and freezing. He escaped by crawling on broken ice slabs to the shore. He was educated at Bruce Castle School, Tottenham, then at Rugby, and finally abroad in Germany and Austria—his parents hoped he would become a doctor. However, his love for natural history led him to want to study the ways of wild animals in their native habitat. His imagination was strongly fuelled by the literature of African exploration and hunting, Dr. David Livingstone, and William Charles Baldwin in particular. He would eventually become as great a hero and fictional character himself. Going to South Africa when he was 19, he travelled from the Cape of Good Hope to Matabeleland, which he reached early in 1872, and where (according to his own account) he was granted permission by Lobengula, King of the Ndebele, to shoot game anywhere in his dominions. From then until 1890, with a few brief intervals spent in England, Selous hunted and explored over the then little-known regions north of the Transvaal and south of the Congo Basin, shooting elephants and collecting specimens of all kinds for museums and private collections. His travels added greatly to the knowledge of the country now known as Zimbabwe. He made valuable ethnological investigations, and throughout his wanderings—often among people who had never previously seen a white man—he maintained cordial relations with the chiefs and tribes, winning their confidence and esteem, notably so in the case of Lobengula. In 1890, Selous entered the service of the British South Africa Company, at the request of magnate Cecil Rhodes, acting as guide to the pioneer expedition to Mashonaland. Over 400 miles of road were constructed through a country of forest, mountain and swamp, and in two and a half months Selous took the column safely to its destination. He then went east to Manica, concluding arrangements which brought the country there under British control. Coming to England in December 1892, he was awarded the Founder’s Medal of the Royal Geographical Society in recognition of his extensive explorations and surveys, of which he gave a summary in a journal article entitled “Twenty Years in Zambesia”. He returned to Africa to take part in the First Matabele War (1893), and was wounded during the advance on Bulawayo. It was during this advance that he first met fellow scout Frederick Russell Burnham, who had only just arrived in Africa and who continued on with the small scouting party to Bulawayo and observed the self-destruction of the Ndebele settlement as ordered by King Lobengula. Selous returned to England, married, and in 1896 the couple settled on an estate in Essexvale, Matabeleland, when the Second Matabele War broke out. The outline of the foundations of this house can be viewed on Google Earth map reference 20°11′27.49″S 28°55′53.18″E approximately 5 meters north of the track perched 80 feet above the Ncema River. He took a prominent part in the fighting which followed, serving as a leader in the Bulawayo Field Force, and published an account of the campaign entitled Sunshine and Storm in Rhodesia (1896). It was during this time that he met and fought alongside Robert Baden-Powell who was then a Major and newly appointed to the British Army headquarters staff in Matabeleland. On 4 January 1917, Selous was fighting a bush war on the banks of the Rufiji River, against German colonial Schutztruppen, outnumbered five-to-one. That morning, in combat during a minor engagement, while creeping forward, he raised his head and binoculars to locate the enemy and was shot in the head by a German sniper. He was killed instantly. He led a singularly adventurous and fascinating life, with just the right alternations between the wilderness and civilization. He helped spread the borders of his people’s land. He added much to the sum of human knowledge and interest. He closed his life exactly as such a life ought to be closed, by dying in battle for his country while rendering her valiant and effective service. Who could wish a better life or a better death, or desire to leave a more honourable heritage to his family and his nation? He was buried under a tamarind tree, near the place of his death, in today’s Selous Game Reserve, Tanzania, in a modest, flat stone grave with a simple bronze plaque reading: “CAPTAIN F.C. SELOUS D.S.O., 25TH ROYAL FUSILIERS, KILLED IN ACTION 4.1.17.” Exactly a year later, on 4 January 1918, his son, Captain Frederick Hatherley Bruce MC, was killed. He was a pilot with Royal Flying Corps, in a flight over Menin Road, Belgium. 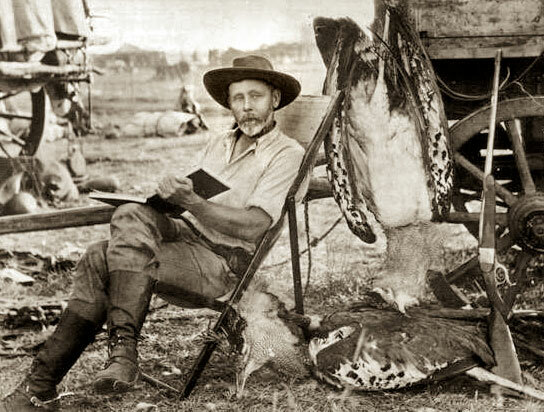 Beside his powerful ties, like the ones with Theodore Roosevelt and Cecil Rhodes, military achievements, and books he left behind, Selous is mostly remembered as one of world’s most revered hunters, as he pursued big-game hunting not only in his southern African homelands but in reputed wildernesses worldwide, subsequently. Accounts of his youth are filled with stories of trespassing, poaching, and brawling, almost all within romanticised and humorous portrayals, but one in particular, in 1870, stands out as more serious: when in Wiesbaden, Prussia, he knocked unconscious a Prussian game warden who tackled him while stealing buzzard eggs for his collection, and had to leave the country at once in order to avoid imprisonment. Then he moved to Austria, and when in Salzburg he went big game hunting for the first time, in the nearby Alps, he shot two chamois. On 4 September 1871, at the age of 19, he left England with £400 in his pocket, determined to earn his living as a professional elephant hunter, and by the age of 25 he was known far and wide in South Africa as one of the most successful ivory hunters of the day. Selous journeyed in pursuit of big game to Europe (Bavaria, Germany in 1870, Transylvania, then Hungary but now Romania in 1899, Mull Island, Scotland in 1894, Sardinia in 1902, Norway in 1907), Asia (Turkey, Persia, Caucasus in 1894-95, 1897, 1907), North America (Wyoming, Rocky Mountains in 1897 and 1898, Eastern Canada in 1900-1901, 1905, Alaska and Yukon in 1904, 1905) and the “dark continent” in a territory that extends from today’s South Africa and Namibia all the way up into central Sudan where he collected virtually every specimen of all medium and large African mammal species. On 2 May 1902 Selous was elected Associate Member of the Boone and Crockett Club, a wildlife conservation organisation founded by Theodore Roosevelt and George Bird Grinnell in 1887. Theodore Roosevelt and Selous in Africa, ca 1909. Mr. Selous is the last of the big game hunters of Southern Africa; the last of the mighty hunters whose experience lay in the greatest hunting ground which this world has seen since civilised man has appeared herein. In 1909, Selous co- founded the Shikar Club, a big-game hunters’ association, with two other British Army Captains, Charles Edward Radclyffe and P. B. Vanderbyl, and regularly met at the Savoy Hotel in London. The association’s President was the Earl of Lonsdale; another founding member included the artist, explorer, and Selous biographer John Guille Millais. He was a rifleman icon and a valued expert in firearms. Early in his hunting career, in the mid-1870s, Selous favoured a four bore black powder muzzleloader for killing elephant, a 13 lb short-barreled musket firing a quarter-pound bullet at with as much as 20 drams (540 grains) of black powder, one of the largest hunting caliber fabricated, literally a small hand cannon. He could wield it even from horseback. Between 1874 and 1876 he slew exactly seventy-eight elephants with that gun, but eventually there was a double loading incident together with other recoil problems from it, and he finally gave it up as too “upsetting my nerve”. He used a ten bore muzzleloader to hunt lions. After black powder muzzleloader behemoths became obsolete and metal-cased cartridges and smokeless gunpowder came into use, despite the fact that he was bombarded with gifts from the finest London gunmakers in hopes of advertisement (indeed he tried many), he was to be found accompanied in his hunt by two rifles, single shot, falling block Farquharson action, Metford-barelled rifles in the two calibers he loved best: a Romanian .256 Mannlicher for smaller game and a .450 Nitro Express for larger game. His favorite gun makers were Gibbs of Bristol and Holland & Holland of London. There are quotes as to how Selous was in fact not a crack shot, but a rather ordinary marksman, yet most agree that was just another personal statement of modesty from Selous himself. Regardless, he remains an iconic rifleman figure and, following in the tradition of others, the German gunmaker Blaser and the Italian gunmaker Perugini Visini chose to name their top line safari rifles the Selous after him. Many of the Selous trophies entered into museums and international taxidermy and natural-history collections, notably that of the Natural History Museum in London. In their Selous Collection they have 524 mammals from three continents, all shot by him, including nineteen African lions. In the last year of his life, while in combat in 1916, he was known to carry his butterfly net in the evening and collect specimens, for the same institution. Overall, more than five thousand plants and animal specimens were donated by him to the Natural History section of the British Museum. This collection was held from 1881 in the new Natural History Museum in South Kensington (which became an independent institution in 1963). Here, posthumously in 1920, they unveiled a bronze bust of him in the Main Hall, where it stands to this day. He is mentioned widely in foremost taxidermist Rowland Wards catalogues for world’s largest animal specimens hunted, where Selous is ranked in many trophy categories, including rhinoceros, elephant and many ungulates. He was awarded the Royal Geographical Society’s Founder’s Medal in 1893 “in recognition of twenty years’ exploration and surveys in South Africa”. Every year elephants were becoming scarcer and wilder south of the Zambezi, so that it had become impossible to make a living by hunting at all. The Selous Game Reserve in southeastern Tanzania is a hunting reserve named in his honour. Established in 1922, it covers an area of more than 17 000 m² (44 800 km²) along the rivers Kilombero, Ruaha, and Rufiji. The area first became a hunting reserve in 1905, although it is rarely visited by humans due to the strong presence of the Tsetse fly. In 1982 it was designated a UNESCO World Heritage Site due to the diversity of its wildlife and undisturbed nature.